“Iceberg ahead!” I might have said this one too many times as we zipped around the Jökulsárlón glacier lagoon on a Saturday morning in early October, but something about the cold air striking against my face and the faint odor drifting from my borrowed flotation suit made the *slightly misquoted and somewhat insensitive* “Titanic” reference seem extra amusing. Luckily, no one could really hear me, given the noise from the motor and the fact we were all donning warm, muffling head wear. If you’re considering visiting Jokulsarlon on your Iceland vacation, read on for everything you need to know about this bucket-list experience and scroll to the end for an iceberg slideshow. What is the Jokulsarlon Glacier Lagoon? Formed by the retreat of Breiðamerkurjökull, an outlet of the massive Vatnajökull ice field in southeastern Iceland, Jokulsarlon is a more than 800-foot deep lagoon that flows out to the Atlantic Ocean. Large chunks of ice are constantly breaking off from the glacier, and if you listen closely, you can often hear them cracking. You might even be lucky enough to see one pop up in the water or flip over! As they melt and get smaller, the icebergs will float out to sea with the tide, but some of them also get washed onto the black sand shore (aptly known as Diamond Beach). Which means you can literally play with, touch, take pictures, or sit on a piece of glacier that’s been hanging around for hundreds of years. 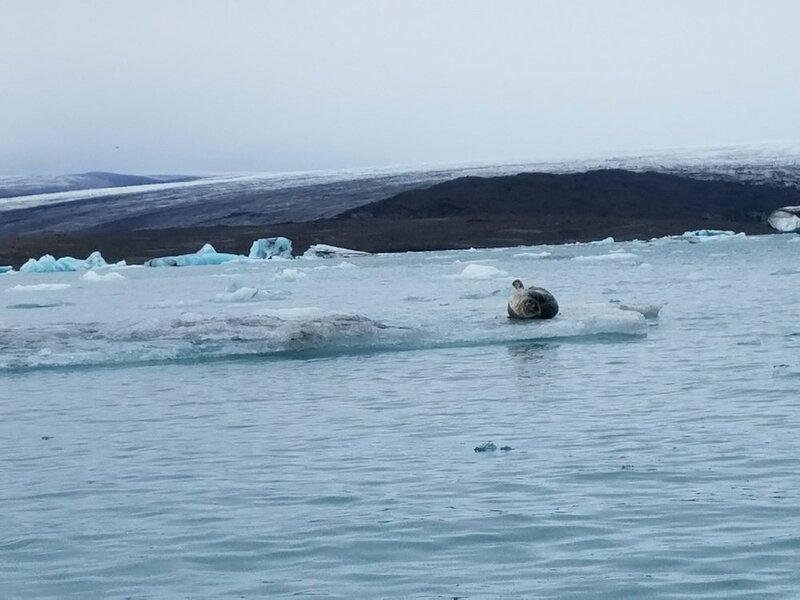 Proximity to the ocean also means that sea critters sometimes make their way into the lagoon, like the adorable (but smelly) seal we saw floating on a chunk of ice. How do I get to the Jokulsarlon Glacier Lagoon? Jokulsarlon is about 230 miles east of Reykjavik right off of Route 1, or about a 5-hour drive, though I recommend taking a couple of days to cruise that stretch of road if you want to take time for excursions and to fully appreciate it. If you rent a car as we did and want to stay nearby, there are a couple of guesthouses in Hof, or you may want to continue on to the town of Höfn for more dining and accommodation options. There also are plenty of guided tours available from Reykjavik, if you prefer to have someone else shuttle you around while you sit back and enjoy the incredible views! Driving this stretch along Route 1 is simple, though, and Jokulsarlon is visible from the road and impossible to miss. You'll know you're getting close when you start seeing glaciers in the distance! What is there to do at Jokulsarlon? On the coastal side of the road is Diamond Beach, where you can walk around and check out the ice that has washed up on shore. The landscape is always changing, so you never know what kind of formations you'll encounter. Some are the size of ice cubes, and others might tower over your head! The best views of Jokulsarlon are from the inland side of Route 1, where you can walk along the lagoon or hop on two different types of boat tours to get up close and personal with the icebergs. Amphibian boats drive groups of about 20 straight from land into the water for a 40-minute ride around the icebergs. You’ll learn how they formed from an English-speaking guide and have an opportunity to taste a chunk of ice. The zippier Zodiac tours approach the glacier tongue, though as our guide explained, you don’t want to get TOO close and risk a freshly flipped iceberg sneaking up on you. Kids must be at 10 years old for these rides, and able to hold on when the boat is speeding along. We opted for the Zodiac excursion and appreciated how it blended a thrilling speed ride through icebergs (à la James Bond, which has filmed here) with plenty of photo stops. 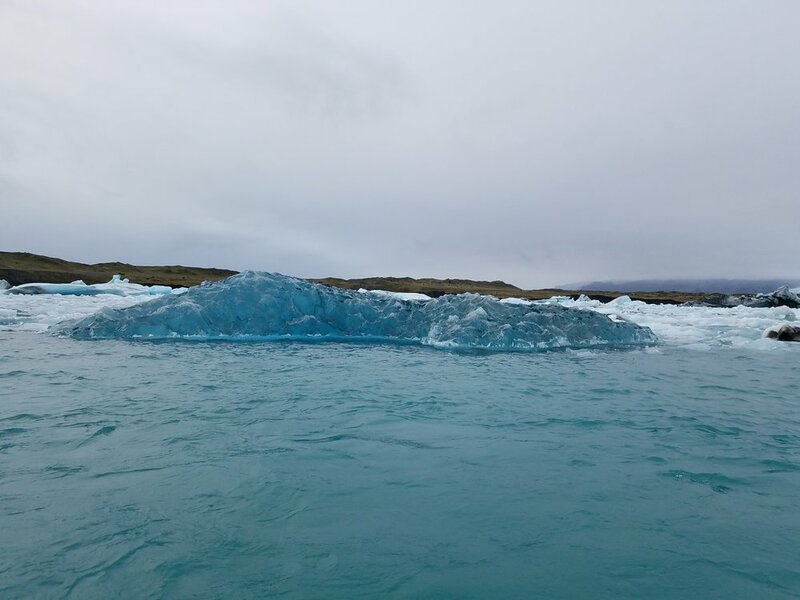 Since you sit on the sides of the watercraft, you'll have unobstructed, up-close views of the 'bergs. How should I dress for the Jokulsarlon boat ride? You’ll cruise along at a relaxed pace on the amphibian ride, so wear as many layers as you need to be comfortable outside for an hour or so. This depends on the weather any particular day, so check this packing guide for what to bring on your Iceland vacation. The Zodiac tour is colder since you’re going fast, but you’ll be outfitted with a full-body floatation suit that adds quite a bit of warmth. I still wore a puffer jacket, insulated pants, and a knit cap, but my gloves stayed off most of the time because I was snapping so many pictures (my hands were cold though, so definitely bring gloves). You'll don a life vest at all times on both tours. When should I go to the Jokulsarlon Glacier Lagoon? Boat tours on the lagoon typically start in May and run through September (Zodiac) or November (amphibian), though it depends on how the weather is faring. Zodiac excursions were still running in early October when we visited, but don't count on booking one past September. You can visit the lagoon any time of year, though. There are large parking lots on either side of Route 1, right next to the lagoon and Diamond Beach, so you can easily explore both sites. A small cafe and souvenir shop by the lagoon remains open year-round and serves a small menu of soups, sandwiches, and hot drinks. Though the boat tours are an amazing experience, if you’re visiting in winter it’s still worth the drive just to see and take photos of the amazing ice formations, especially since there are so many incredible stops along the South Coast on the way. Plus, in winter you can join one of the amazing ice cave tours near Vatnajokull that depart from here. Make sure to book Zodiac and ice cave tours ahead of time, as they can sell out. The amphibian tours run more frequently, so you might be able to snag one onsite.